This workshop is suitable for complete beginners as well as for advanced students. Restorative yoga improve well-being and combate fatigue, improve quality of life, and reduce symptoms of depression and anxiety. This slow pace of Yoga is also a promising tool for stress management. “Stillness of the body can promote stillness of the mind”. 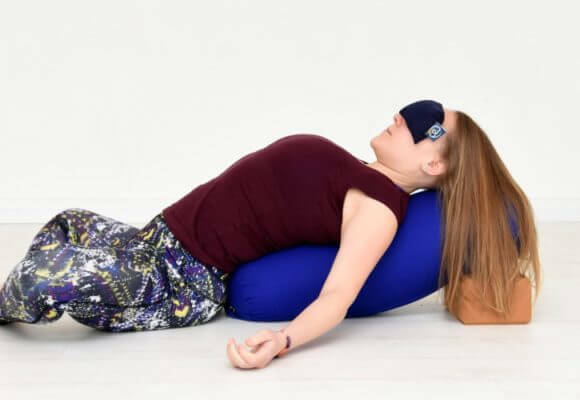 This 2-hour workshop sequence aims the adrenal fatigue that will help you to unwind, de-stress, and reset your adrenal glands. Expect to be a soothing and deeply relaxing practice to invoke a deeper connection to the Heart. The integration of that energy more clearly into your life will bring about healing, awakening, expanding and nourishing results. The sounds and vibrations of singing bowls and chimes guide us into a deep meditation. The healing vibrations pass through our body, opening blockages and allowing our minds to quieten. The physiological impact of sound on the body, emotions & cognition is apparent. Through the vibrations of these instruments, we experience an inner calm and deep relaxation that enable us to journey within and centre ourselves. Practicing restorative yoga helps to eliminate fatigue and stress that accumulates in our daily routines. Address: 28 South William St.